Are we getting value creation all wrong? Why alignment diagrams, customer experience and customer journey mapping are essential strategic tools for the whole enterprise. I recently provided research and analysis for a literature review assessing historic and current thoughts from academia and business on defining and delivering value. I found this to be an incredibly important topic particularly because changing technology, digital customer engagement and the exploding amount of touch points in the customer journey is having such a profound impact on perceptions of value. What struck me, is most of the literature had an inside out perspective with linear logic. What I mean by this is, at a high level, the literature essentially followed a path of planning, execution and review, focusing on internal business functions determining tangible and intangible benefits, costs, risks and present value of investments. It was very rational, logical and process orientated. If you have ever been involved in assembling a business case in the enterprise, SME or government sector you will be familiar with the process. Another observation was the literature was also very product centric. The literature opted for themes of the product living in isolation or part of a related product portfolio. I felt this was framing value creation in the context of manufacturing, assets used for mass production and supply chain creates value. This is potentially because these were the cash cow concepts for management consulting and academia for the last century? The literature didn’t address the emerging nature of integrated modular ecosystems, the changing nature of customer interaction with digital and physical channels or the changing nature of customer preference. In fact there was little research on outside in customer centric perspectives. Any research that did touch on these concepts were limited to the ‘digital fringes’ and not mainstream core business management or academic thought. Assembling a business case is the executional output of a strategic plan. It is a strategic initiative that articulates the delivery of value outlining the benefits, costs and risks to the enterprise in a way that allows for simple comparison against other strategic initiatives. This way the executive can evaluate competing requests and decide where and how to allocate limited resources. A strategic plan is something the executive and/or the strategy team develop but rarely does it explore value for the customer and if it does, generally with a low level of detail. Compounding this issue, the research indicated the people who develop the strategic initiatives and business cases, rarely developed an outside in customer centric view. Again everything was linear and inside out. They may do research on product based value perceptions of ‘use value minus opportunity costs equals created value’ (see diagram below) but rarely do they articulate how the customer interacts with the products and/or services at the strategic or business case level. 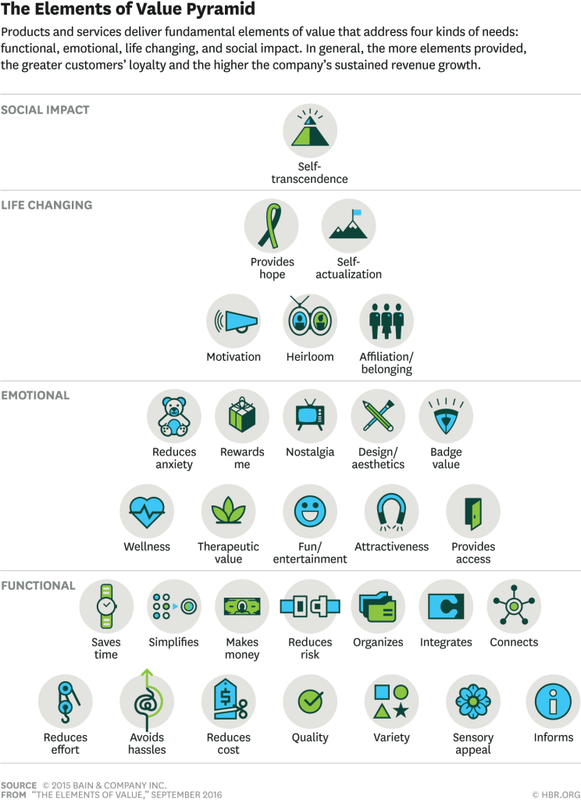 The above diagram is a good visual to understand the components of value but what about value creation in the context of an always-connected digital world? From whose perspective are we exploring and defining value? How do we evaluate and articulate beliefs and emotional value beyond functional concepts? How do we empathize and put the business in the shoes of the customer? How does a business forecast, measure and distribute value when today’s market demands an interactive, engaging, and useful digital experience that encourages a conversation between the business and the customer? This dialogue seeks to provide sufficient value so that the customer can largely service themselves. I would argue that alignment diagrams including customer experience and journey mapping must now become an enterprise strategic tool and not something that the digital or marketing team does in isolation. It should be a holistic exercise involving key stakeholders, customers, and suppliers to ensure value definition and value alignment. This starts with looking first at the value a business needs to create from the customer’s perspective, and then linking this to a considered strategy and technology roadmap and architecture to deliver that value. Moving from inside out to outside in thinking. Focuses on building customer empathy. Can build internal empathy and needed support. Visualisation aligns people to common understanding. Common understanding of areas outside of their sphere of influence. Fast tracks efficiency issues and areas for improvement. Highlights areas for innovation and new revenue possibilities. Challenge of integration and maintenance of disparate technologies. Not seeking outsider views on how they create value. Not including representative views from every customer touch point. Not including the customer in definitions of value and what customer experience means to them. Thinking value creation is a ‘project’ with a defined beginning and end, not an ongoing exercise in iteration and optimization. Not understanding that in a digitally connected world the experience is more important than the end transaction. Not understanding that a satisfied workforce creates a positive environment and experience for the customer. Not having the skills or holistic systems thinking capabilities that can overarch sales, marketing, IT, and other aspects of business. Not seeing Agile philosophies as an enterprise endeavor beyond software development. That universities are inadequately preparing graduates for a digital future. That innovation for executives in corporate SME’s and enterprises can often be lip service (See IBM infographic below). I won’t go into too much detail in this blog on securing executive sponsorship, overcoming fear of failure, developing an agile hypothesis driven experimentation engine, planning for the mapping exercise, or building the team etc. That is a much bigger topic! However I will provide some ideas on a couple of maps and a useful framework to understand value. Buyer profile and persona development. The focus is on creating value. Value centred design starts a story about an ideal interaction between an individual and an organization and the benefits each realizes from that interaction. This process puts the participants in the customers shoes and allows the to understand benefits, enablers and barriers through out the journey. A point should be made on the difference in terminology between a technology vendor’s customer journey mapping capability and what I am discussing. In the technology vendor’s world customer journey mapping is an executional activity, for example in a marketing automation system, visual tools to link activities to process to decision logic and automation. Whereas customer journey mapping, as I am discussing, is a strategic view that incorporates a holistic view of an end-to-end activity system the customer interacts with. In regards to frameworks, recently Bain and Co. published in the Harvard Business Review September 2016 edition what they call ‘the value pyramid’ (see below). I really liked this visual representation of value in addressing customer needs because it provides a framework that allows us to put ourselves in the customer’s shoes and debate what value means to them at a hypothetical level. This allows the team to start internally, possibly by weighting each value driver to develop a hypothesis and an assumed customer journey. It allows us to validate or disprove our value hypothesis with actual customers through data gathering techniques including interviews, surveys, workshops or interactive simulations. This approach can also be enriched by data on existing touch points if available in a meaningful form. Developing a higher order of value beyond functional value is critical if a business wants to create an emotional link with their customers. Research indicates that customers with strong connections to brands have higher rates of consideration, purchase, and willingness to pay a premium. Based on the literature review research and corporate experience I believe an organisation wide rethink on value creation is required, particularly when many layers of business have become software driven with many roles becoming unwitting software developers themselves. For example, anyone who has used decision logic in a program to automate a repeatable process is a basic software developer. In fact the marketing function more so than any other business function is rapidly becoming the first and ongoing point of customized one to one digital customer engagement. I would also argue that in the not too distant future this function could become the strategic cornerstone of a businesses competitive advantage. What will our children at school who in the next 10 years will be in the workforce expect and become if this trend continues throughout business? It’s certainly an exciting time! Sirius Decisions reported that 67 percent of the buyer’s journey is now performed digitally. This alone indicates that business needs to include alignment mapping in its strategic capability. However Sirius Decisions subsequently clarified their own research by stating that 67% is not absolute and that physical touch points or early sales engagement is also relevant. More importantly they state, “it’s not about marketing and sales alignment… …It’s about alignment across the whole organization.” This to me highlights the importance of alignment mapping as a holistic exercise that incorporates the whole business in delivering a positive customer experience. Willingness by business to collaborate, hypothesize, experiment and iterate is required. Visualization is a great tool to be included in the strategic toolset. Richard is Managing Director of nMerge Pty Ltd providing consulting, systems and services to Australian companies as well as partnering with marketing and sales technology vendors and thought leaders in Europe and Silicon Valley, USA. His obsession is helping companies solve problems at the intersection of the customer centric application of technology, marketing and sales programs. Richard holds an MBA, Master of Information Systems Management, Diploma of Applied Arts (Graphic Design) and certifications in PRINCE2, and Agile DSDM.